For me this is a tough one... looking at the piece I don't see any wear even on the high points.. But it's clear to see this coin doesn't have any luster anymore.......... So either that's a coin that's somehow toned over in what I can only say is unappealing manner, or what I suspect is that this coin may have been dipped too many times.. I agree that the surface is strange but, to me, even the portrait looks not quite right. I don't know if I have any Peace or Morgan dollars (they made both in '21). The chin looks wrong, but it may just be that it is magnified so much. Hard to believe that they would fake the most common Morgan that there is. The coin seems to have considerable contaminant on it. As most of you are aware, in the 1800's and first half of the 1900's many people had a great distrust of the banks so they would put money in cans or sacks and bury it in the ground. The lack of luster could be the result of a chemical reaction to the soil if this coin was buried. I have in the past found some new coins that had been buried in the ground and were perfect except for the lack of luster to them. Also last year a friend told me of the old hundred dollar bank notes his grandmother had given him. She had placed them in a tobacco tin and buried them in the ground. They were all new when she placed them in there. When she unburied them 2 or 3 years back and gave them to him they had a distinct curvature (due to the curve of the can). They also had been tainted by the chemical reaction of the soil and air and also had a musky odour to them. Bill you are right about the chin. I also noted some small differences in the lower neck hair and the 2 leaves at the top around the " I ". Counter fitting is a small possibility, however when you take into account the way dies were created at that time, small variations are always possible. Hi guys. 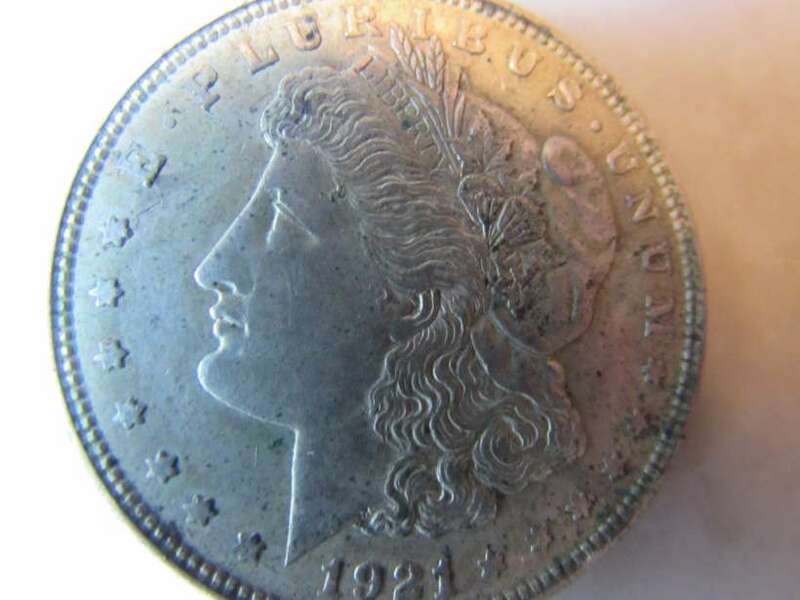 Was just reading up on the 1921 Morgan silver dollar and it appears that it might be a Zerbe Proof which was also minted in 1921. If you look at the bridge of the nose (a place where many fakes can be determined), the 2 photos in the accompanying article are slightly different and not from the same dies.